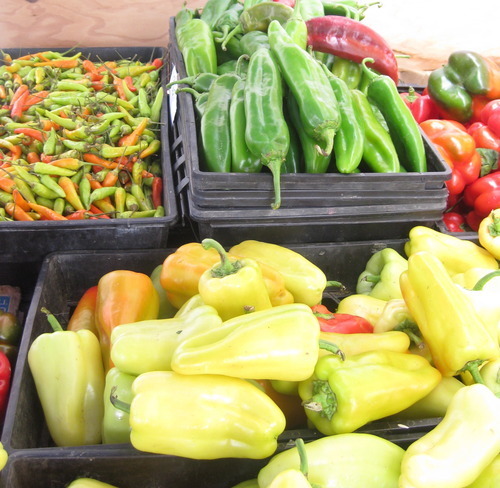 There are packs and pecks of all sorts of peppers available at Seattle area farmers markets these days! Such a pretty variety of colors, shapes and sizes. These lovelies were at the Bautista Farms stand at the Crossroads Bellevue Farmers Market last Tuesday! Of course I couldn’t pass all these bright colors up, so I picked up a few different types of pepper. When I asked about my choices, I learned that I’d selected mostly sweet, very mild peppers -very versatile and tasty. I left the market with some purple bell peppers, a sweet pimento pepper, an orange anaheim pepper, and a yellow pepper of undetermined type that came from a basket marked “Sweet.” Sweet! When I got home, I started to do some pepper research and discovered there are tons and tons of different types of peppers. I wasn’t sure exactly what varietals I had, but I was able to learn that all of the peppers I had were very, very low on the Scoville scale, meaning that they weren’t spicy peppers at all. 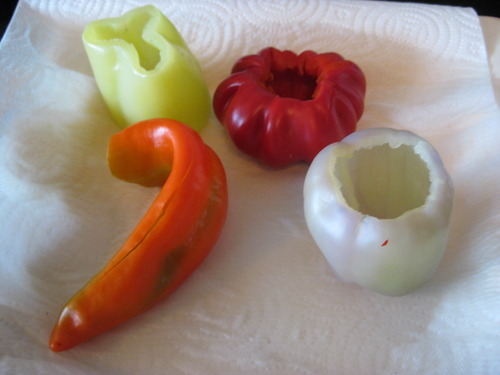 I also learned that pimento peppers are what are stuffed in green olives, but that fresh pimento peppers are very sweet, and that purple bell peppers are mostly similar to other colors of bell pepper, not quite as sweet as red or yellow and not as pungent as green bell peppers. There they are, a peek of the anaheim, my mysterious yellow sweet, two purple bells and that cute pimento! 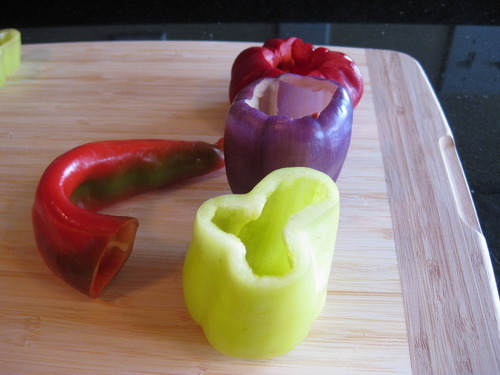 But, of course, the best way to find out about the differences amongst these peppers is to eat them! I decided to try all four types in the same recipe, so I could get a better handle on the flavor nuances and other differences. 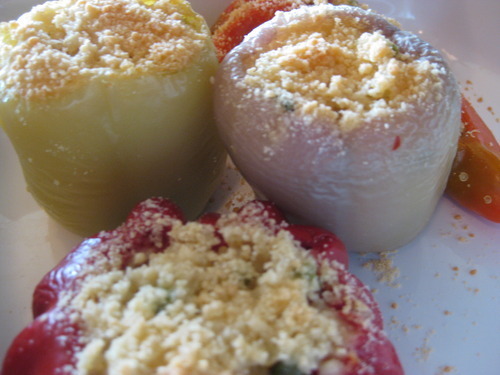 So, stuffed peppers! Using a modified recipe from my Perfect Vegetables cookbook (by the editors of Cook’s Illustrated), I chopped the tops off and cored my four peppers. 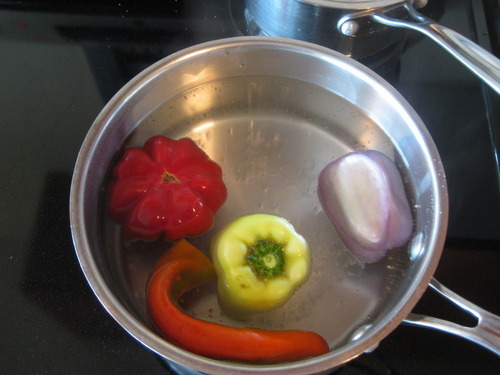 Then I plunged them into some boiling water to cook for 3-4 minutes so they’d be soft and tasty. 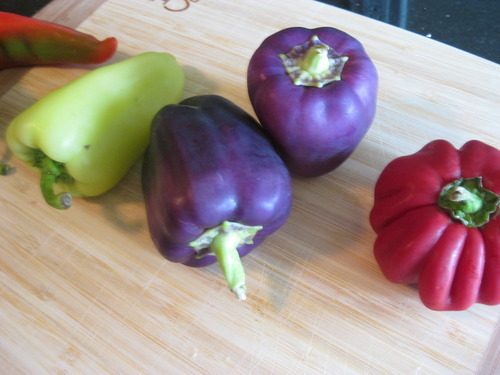 And my purple pepper got a lot less purple. Darn. Not nearly as fun. Everybody else looks nice and bright still though! While my peppers cooled, I made the stuffing. The original recipe called for rice and ground beef, but I decided to use a mixture of quinoa, chopped tomato, green onion, and red onion, all mixed with olive oil, lemon juice, and salt and pepper (of course!). This quinoa salad is very tasty on its own, and I figured it would work well as the stuffing -maybe a little more exciting than rice! My favorite pimento, all stuffed and ready to bake! 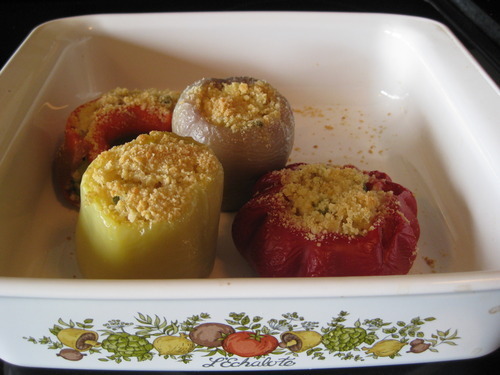 I topped them with parmesan cheese and then popped them in the oven for 30 minutes. Crinkly skin and melty cheese! Looks good! Except for that purple guy, who looks a little wan. Oh well. I bet it’ll still taste good! Which one do you think will be the best? We tried all four, and my fave, the darling pimento pepper was the tastiest, followed by the purple bell! The yellow sweet lost a lot of its sweetness in cooking and was a little bland, and the anaheim’s skin was a little too thick for this preparation. But the pimento retained tons of sweetness and lots of pepper-y flavor, while still looking great! 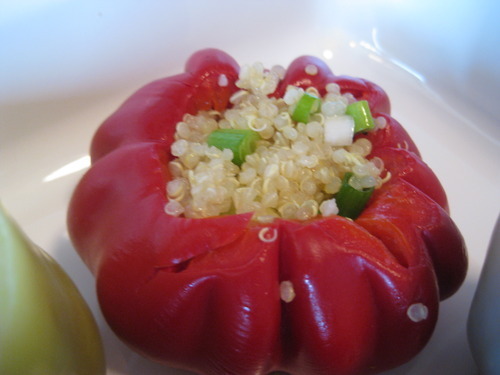 Fresh pimento peppers are great for stuffing! They are very sweet and flavorful, and their small size makes them great appetizers. Purple bell peppers are very pretty raw, and taste good both raw and cooked, but lose a lot of their nice color when cooked. 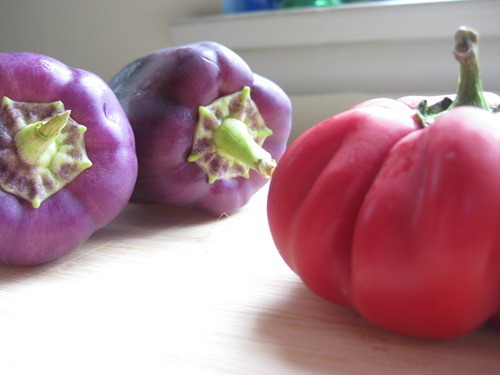 They might be better used in raw dishes or quick sautes, where more purple shines through! Yellow sweet peppers are very tasty and crunchy raw, but lost a lot of flavor when cooked. This would probably have been a better pepper for a salad. Anaheim peppers are tasty, but their thick skin makes them better for roasting and peeling, or using in a dish like chile rellenos, where the skin is charred. Not the best for roasting! A pepper primer! There are, of course, many more types of peppers still available at the markets, so I’ll have to do some (careful!) experimenting with spicier peppers sometime soon! This entry was posted in In the Kitchen (recipes & more) and tagged anaheim pepper, Lisa Wheeler, peppers, pimento pepper, purple bell pepper, Real Time Farms. Bookmark the permalink.